This post is for you, the one I loved so much. This day, 17th marks the second monthary of our relationship. Will you remember this date & this girl? I know you are working or sleeping by this time. Thanks for being the best boyfriend in my whole life. The one who give me the sweetest & unforgettable love. The one who taught me how to be independent on my own. The one who never controls me on choosing my friends. The one who taught me how to be a better person. The one who ask me to forget you, but I know, I won't not. Just blame on me, not being a faithful girlfriend. I'm the one who let you down, hurting you. I'm the one who promised you, I will be your last. But couldn't be the one now. Just my fault. 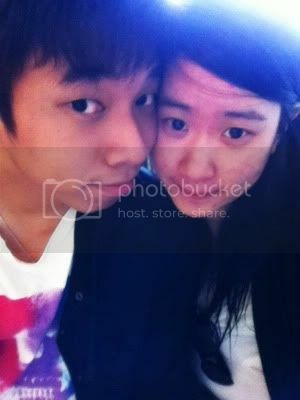 That past one month, i am really happy w you. Please take care of yourself when I'm not around. When no one is there to take care of you. Please remember to eat when you are working. I will happy if you will remember me, somehow, somewhat. And doubt you will see this post, again. You have become, a beautiful part in my life. Look at the time, pleaseeee. I haven't gone to bed. Was lying on bed, and my phone just couldn't stop blinking. Answered awhile and kup call. & I don't know what time could I get to sleep. I'm so gonna go out later in the noon, hope I can stand it. I have changed bloglink, cause I want to keep that bloglink as me and you de memories.